Printed in full color on every page. 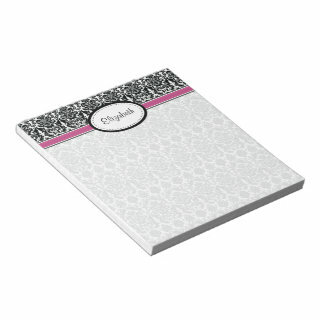 Elegant hot pink, black, and white vintage damask floral personalized notepad. You can personalize the name on this custom notepad using the personalization tools on the Zazzle website. 40 single side tear-away pages. Design printed on every page. Please allow 5-8 business days for notepad manufacturing. *Shipping estimates will vary depending on the shipping method selected at checkout, and are not included in the manufacturing turnaround times posted. Zazzle notepads are printed and shipped in the US, even if ordered off of international sites. Please allow sufficient time for international shipping.